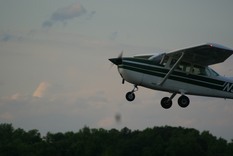 Isaac Carmichael started his flying with Bob Chandler and Mike Mercer of Chesapeake Aviation, in Chesapeake, Virginia. Bob’s faith in Christ and Mike’s F-15 fighter-pilot-form were well suited to prep Isaac for the on-the-edge life and flying of a missions bush pilot. Bob was the first to get Isaac’s hands on aircraft maintenance, allowing Isaac to remove a plane’s damaged strut. His first day landing, Mike gave Isaac a thorough introduction to ‘slips’ at altitude, and practice-approaches above farm roads. Isaac ended his lesson with four landings. The last angled approach was further down the runway than Mike would have preferred, so he directed Isaac to execute a slip (allows him to lose altitude without gaining speed). Isaac executed it well with a smooth landing. On another day, only two-hours-flying later, Mike and Isaac found themselves returning to the field with strong crosswinds. Experienced pilots came in to the lounge complaining of the great difficulty they had landing. When Mike and Isaac walked in later, Bob Chandler asked how Isaac was doing. Mike replied, “Only three hours and he’s landing all the crosswinds.” At seven hours of flying, Mike took Isaac up to clear him for solo. 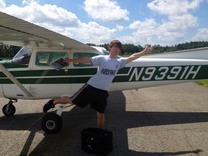 After .7 hours of warm-up, Isaac took his first solo flight. After much prayer, visits to various flying and maintenance schools, Isaac knew his vocational path was through the Trinity Aviation Academy in Eatonville, Washington. Since being at TAA (at the time of this writing), Isaac has earned his Private Pilot certificate, has added 130 hours of flying and has worked on aircraft powerplants or airframes for thousands of hours. He’s found and plugged in to a local church congregation where he has been involved in home groups and volunteered in music and youth ministries. In June, 2017, Isaac was given a personalized tour of the JAARS (Jungle Aviation And Radio Service) aviation operations center in Waxhaw, North Carolina. It was a great opportunity to see the complexity of the logistics required to support Christian missions aviation, and to see the various possibilities of how one can serve in missions aviation.